This post is long overdue. I meant to have it constructed and published for his birthday back in October. However, with the Cardinals’ postseason run combined with my workload at school, I had to put it off until now. It may be a little different than my usual Cardinal posts, but I hope you all still enjoy it. This past spring, my dad, Mark Schwarz, was finally, rightfully inducted into the St. Louis University Hall of Fame of Athletics–thirty-five years after his last pitch for the Billikens. Since he played before 1980, he is officially classified as a “Billiken Great-Pioneer” in the Hall of Fame. 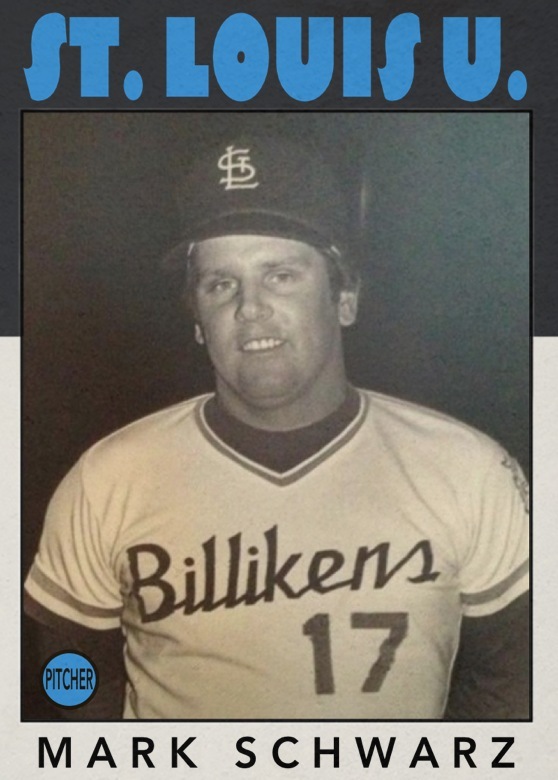 He was one of the top starting pitchers at the university from 1975 through 1978, but before I detail his college numbers, including a record that will likely never be broken, I will go over some news and notes on his baseball career before his years at SLU. Considering he played before my time, obviously, it was pretty tough finding consistent yearly information, so what follows is really the best I could do. He burst onto the scene for the Dragons, having a solid freshman season–highlighted by a no-hitter. In his first game as a sophomore, he recorded 13 strikeouts against St. John’s and recorded another no-hitter. In fact, he did not allow a hit in his first 11 innings pitched as a sophomore for the Dragons. I checked through various newspaper clippings and came across this one: “Schwarz Better than Best as St. Mary’s Edges DuBourg, 3-1.” That is pretty high praise if you ask me. In his very last game for St. Mary’s, he threw a 1-0 shutout against the Vianney Golden Griffins–clinching the Catholic Athletic Conference title. One start after his 1-0 shutout against Vianney, he threw another 1-0 shutout–this time for the Pro’s against the St. Louis Junior Stars. He allowed only two hits while striking out nine. Unfortunately, this is the only information I was able to recover on his career with the Pro’s, but I figured it was definitely worth a share. The Billikens produce a Baseball Outlook with news and notes for the upcoming season so that fans know what to expect from the team. Well, prior to my dad’s freshman year (1975) with SLU, they described him as a “5’11” hard-throwing right-hander who was the [St. Mary’s] Dragons’ MVP as he won 6 game during ’74.” He had a solid freshman season for the Billikens–pitching seven complete games. 1977 was a record-setting season for the Billikens, and my dad played a key role in the team’s overall success. He went 6-5 with a 2.78 ERA and eight complete games. The team went 30-19–the first Billiken baseball team with 30 wins in a season and a school record until 2006. Finally, for his senior season, the 1978 Baseball Outlook read, “Schwarz displays a good fastball and has excellent control. In 1977, he walked only 19 batters while striking out 68 in 74 innings.” The only statistic I could find on his senior season was that he had six complete games–capping off his four year career with 24 total complete games. Unfortunately, many of his records have been broken. This is largely due to the fact that the SLU baseball program has much improved since the teams he played on back in the day. However, he holds a career record that will likely never be broken–complete games. In 40 career starts over 4 seasons, he had 24 complete games–good for 60% of his starts. Sure, being a Hall-of-Famer speaks for itself. However, this does not fully describe the impact my dad has had on the game of baseball as a whole. After his playing days were over, he never really left the game. He coached the Anheuser-Busch American Legion baseball team for a couple years. He coached both my sisters in their athletics. He coached me from kindergarten through my senior year of high school–spanning four different teams–from St. Catherine Laboure CYC baseball to United Van Lines to the Affton Astros to Crestwood American Legion. Though his coaching days appear to be over, he still umpires high school baseball and softball and has been for over thirty years now. Thank you, Dad. I am glad that you finally got the recognition you deserved from SLU Athletics. You had a tremendous impact on SLU baseball, but this does not even compare to the impact you have had on me, Mom, Angie, and Julie. We are so proud of you, Hall-of-Famer. Here is the official SLU press release on last spring’s Hall-of-Fame class if you are interested in checking it out. This entry was posted in Hall of Fame, SLU and tagged HOF, Mark Schwarz, SLU, SLU baseball, SLU HOF, St. Louis University by stlcupofjoe. Bookmark the permalink. Awesome tribute to your Dad and glad he is getting the recognition he deserves. All of our Dads are HOF’ers to their kids, mine was. Great post and I’m sure the tribute from you was better than he could ever hope for. Awesome post. Congrats to your dad on this great accomplishment. Very glad to read it!